The Gezi Park uprising in Turkey started by accident. As documented in this video, on May 27, a handful of environmentalists from the Taksim Solidarity group, who were warned by one of their members that construction machinery was moving in, tried to stop the uprooting of the trees on the north side of the park, across the Divan Hotel. That night, around 50 environmentalists camped in the park and were assaulted brutally by the police the next day, when the iconic “girl in the red dress” picture was taken. In response to the police violence, the sit-in grew in size and the police attacked with even greater brutality on May 29 at 5 AM, gassing people in their sleep and burning their tents. Turks being a nation of inveterate tweeters and Facebook addicts, the protest movement then went viral and spread spontaneously to the whole country. Ceyda Sungur, associate professor of urban planning, being sprayed with pepper gas. The Red Dress lady as a symbol of police brutality against innocents (she is actually Ceyda Sungur, associate professor of urban planning at the Technical University of Istanbul) combined with Erdogan’s brash taunts that he would build the replica Ottoman barracks regardless of the protests, and add a mosque for good measure, simply enraged the 53,4% of Turks who did not vote for the AKP. The police crackdown and Erdogan’s verbal provocations were what created the nationwide protest movement from scratch. Who ordered the police crackdown? It emerged in a June 18 TV interview with Canan Barlas, a journalist with inside links to the AKP leadership, that these assaults on peaceful demonstrators were not ordered by Erdogan. However, the police crackdown was consistent with a pattern of increasing police brutality and official intolerance in Istanbul that started with the banning of the May Day march in Taksim square. Insult was heaped on injury when football holligans celebrated the victory of their team in Taksim on April 27, even shooting weapons in the air, with no police interference whatsoever. 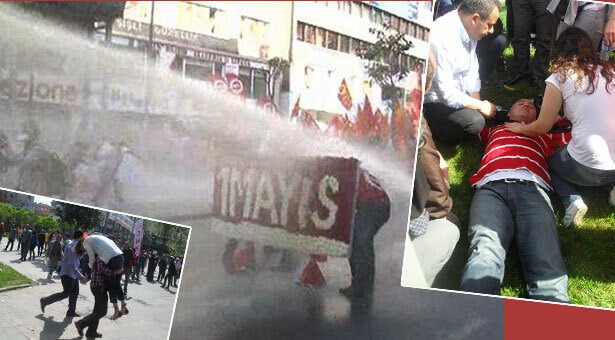 However when demonstrators tried to celebrate May Day on Taksim, hundeds were injured by the police. The author of the May 1 crackdown, Interior Minister Muammer Güler, aka “Neckless Muammer” aka “Chemical Muammer,” publicly boasted about its success in the national media. As former governor of Istanbul, he took a particular interest in the city and in equipping its police with the latest “nonlethal” chemical weaponry. He overruled both the current governor Hüseyin Avni Mutlu, a timid yes-man, and the Chief of Police Hüseyin Çapkin, formerly chief of police of İzmir, where he was known for his relatively tolerant attitude towards street protests. 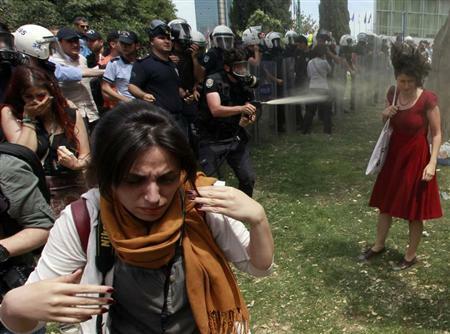 The Gezi Park crackdown of May 28-29 bears the unmistakable hallmark of “Chemical Muammer.” It is a repeat of the provocative banning of the May Day celebrations and the crackdown that followed, right down to the gassing and pressure-hosing of hospitals. A Kurd from Mardin who takes pride in the multiethnic conviviality of that city, Güler rose through the ranks by paradoxically developing a reputation as a hard-liner, thereby gaining the confidence of the “deep state.” He is now one of the most powerful men in the country, a sort of Turkish J. Edgar Hoover. He has files on just about everyone, thanks to illegal spying on Turkish citizens that has become the rule rather than the exception, which make him practically invulnerable. The chemical crowd control equipment used so abusively and with murderous intent against nonviolent protesters was originally purchased by Güler, while he was undersecretary to the incompetent former interior minister İdris Naim Shahin, with just the opposite intent, i.e. to suppress extremely violent PKK demonstrations in 2010-11 that aimed to disrupt Erdogan’s “Kurdish ouverture” without causing fatalities and giving the PKK the martyrs that it was hoping for. The PKK put rock-throwing children in the street, hoping for a repeat of the Palestinian intifada, where Israeli soldiers shot thousands of live rounds at rock-throwing children. A ruthless but intelligent man, Gülen avoided the Turkish state’s traditional reflex of shooting rioters and successfully contained the demonstrations with tear gas and water cannon. It might be difficult to believe but Güler was also, as governor of Istanbul, responsible for the entirely peaceful May Day 2010 celebration in Taksim, the first one since the bloodbath in 1977. Güler is extremely shrewd and ruthless but only resorts to violence when his agenda requires it. Why then did he now choose the apparently irrational strategy of deliberately provoking mass demonstrations against the AKP? The answer to that question is in the United States. Let’s first introduce Fethullah Gülen, the “sage from Pennsylvania” whose legions of followers, all sworn to secrecy, permeate the ruling party, the police, and many other vital institutions. 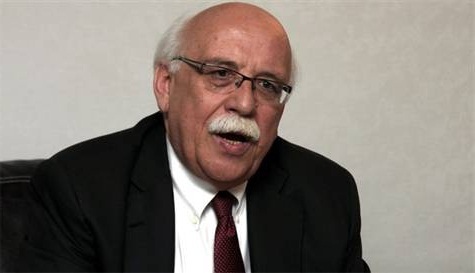 It was this infiltration by Gülen’s “Cemaat” (congregation) of the military that provoked the repeated military coups, attempted and successful, against Erdogan and his mentor, the late Necmeddin Erbakan, as the military defended itself from Gülen’s stealthy body-snatcher invasion and the Islamist governments that gave it support. Gülen is the current éminence grise of the Nur sect, founded by Said-i Nursi, a reactionary islamist bribed by British intelligence to start a military uprising against the parliamentary Young Turk régime in 1909 (the Young Turks were pro-German, which prompted the British to intervene), an uprising in which the Taksim Artillery Barracks that Erdogan is seeking to reconstruct, played a somewhat prominent role. Nursi was one of the few coup instigators who wasn’t hanged when the coup was suppressed. He then became a leading voice of anti-republican, anti-democratic religious reaction. You must move in the arteries of the system without anyone noticing your existence until you reach all the power centers. . . . Until the conditions are ripe, they [the followers] must continue like this. If they do something prematurely, the world will crush our heads, and Muslims will suffer everywhere, like in the tragedies in Algeria, like in 1982 [in] Syria, . . . like in the yearly disasters and tragedies in Egypt. . . . The time is not yet right. You must wait for the time when you are complete and conditions are ripe, until we can shoulder the entire world and carry it. . . . You must wait until such time as you have gotten all the state power, until you have brought to your side all the power of the constitutional institutions in Turkey. The Hodja Effendi fled to the USA shortly before this video was made public. He was tried and convicted in absentio. Turkey’s legal system being a corrupt mess where anything can happen, Gülen then benefited from a general amnesty declared by the Ecevit government, to be subsequently acquitted by an appeals court in 2008. Gülen remained in the US, however, where he had obtained a Green Card, over the strong objections of the FBI and Homeland Security, thanks to the backing of former CIA officers Graham Fuller and George Fidas, as well as former US ambassador to Turkey and notorious neocon Morton Abramowitz. Fuller was CIA station chief in Kabul during the CIA’s anti-Soviet jihad and later vice-chair of the National Intelligence Council. 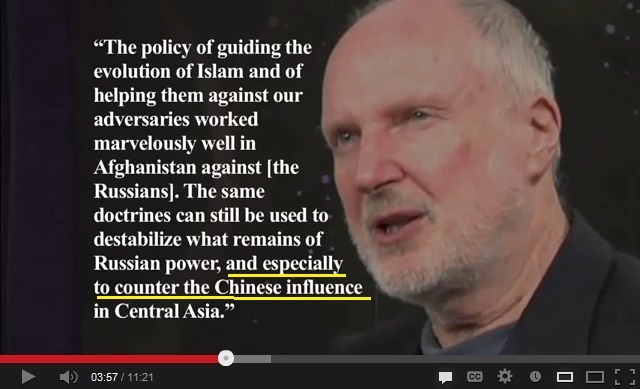 The US strategy of “guiding the evolution of Islam and helping them against our adversaries” is his brainchild. He is also credited with having conceived the illegal Iran-Contra scheme of selling arms to Khomeini’s Iran to raise money for Contra terrorism in Nicaragua. Fuller’s daughter is married to the uncle of the Chechen terrorists who bombed the Boston Marathon. Apparently he “guided the evolution of Islam” a tad too far. When Gülen’s ties to this very senior and influential CIA officer were revealed, Russia shut his schools down and expelled dozens of his followers. The Netherlands launched an investigation. Uzbekistan shut down his schools and arrested dozens of graduates. With Gülen in the US under the protection of the CIA, his schools and his millions of followers became a 6-lane freeway through which the CIA could penetrate the Islamic world. Including, first and foremost, Turkey, of course. However as long as Obama needed Erdogan to topple the Syrian regime, there was little that Gülen could do. In exchange for supporting Al Qaeda in Syria, Erdogan had obtained Obama’s support for “ending” Turkey’s PKK problem. Barzani was also on board, having secured Turkey’s military support against an eventual invasion by the pro-Iranian regime in Baghdad. Gülen quickly toned down his sermons. On September 11, 2012, however, everything changed. In Benghazi, an Al Qaeda offshoot called Ansar Al Sharia, armed and trained by US Ambassador and CIA station chief Stevens for the US’s jihad against Gaddafi, turned its weapons against the CIA. 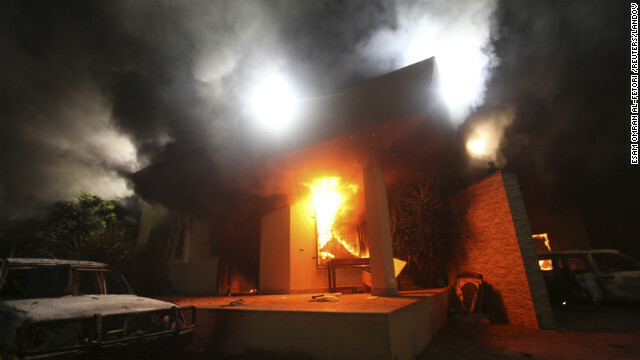 Ambassador Stevens was killed and the entire CIA network in Libya was taken apart. Reeling from the shock, the Obama administration was hit again by the Qatari-backed and Al Qaeda-affiliated Al Nusra terrorists in Syria, who wiped the US-backed Free Syrian Army and its Farouk Brigades off the map. Because of the generous flow of arms and money from Qatar, Kuwait, and certain extremist Saudi sheiks, the now mostly foreign anti-Baath terrorists in Syria all flocked to the Al Nusra flag. Washington then began gradually to pull its irons out of the fire. Iraq had been handed over to pro-Iranian Shiites, Afghanistan was being abandoned to the Taliban and their patron Pakistan, Libya was left to twist in the wind, and Syria would, the US hoped, tear itself apart in a war of attrition. Erdoğan was rapidly becoming redundant. Going to Washington on May 14, he made a last desperate attempt to convince Obama that the US could still salvage the situation by arming Al Nusra and including Hamas in the Quartet negotiations. Although Hamas had moved its headquarters from Damascus to Doha, it was still a terrorist organization as far as Israel, and therefore the US, were concerned. Besides, Obama had already written off his partner in jihad, Sheik Al Thani of Qatar, as a dangerous Al Qaeda supporter – meaning someone who used Al Qaeda for his own purposes and not those of the US. The Obama-Erdogan talks came to an impasse. The only thing that Erdogan got from the visit was a credit rating hike from Moody’s. In his final statement, Obama paused meaningfully when he said “my friend…Recep Tayyip Erdogan.” Erdogan had just been handed a pink slip. A readily-available instrument for removing a head of government in Turkey was sitting in a gated retreat in The Poconos in Pennsylvania. Hodja Effendi finally got the green light from Washington to do Tayyip Erdogan in. He probably got that green light even before Tayyip left Turkey because his point man in the Erdogan cabinet, “Chemical Muammer,” had already tried to provoke a rebellion on May Day. On May 29, he finally got it right. The timing was impeccable because Erdogan was about to go on a 4-day tour of the Maghreb. While he was away, the mice did play. All of them members of Gülen’s Cemaat, President Abdullah Gül, State Minister Bülent Arinç, Education Minister Nabi Avci, and government spokesman Cemil Çiçek made conciliatory, apologetic, and even self-critical declarations. Gül expressed his sympathy for the protesters. Arinç actually received the representatives of the “hoodlums,” as Erdogan called the protesters, apologized for the police violence, and deemed their demands “reasonable.” The education minister marveled publicly at how Erdogan had made a mess of things. Most striking of all, the tough-guy Interior Minister Muammer Güler gave orders to the police to evacuate Taksim on June 1, while Erdogan was still in the country, making inflammatory statements. It was obvious to everyone that Erdogan could not have given such an order, which allowed the Taksim protesters to insult and make fun of him in total liberty. Erdogan looked like he was losing control, making empty threats while a hippie commune occupied Taksim and barricaded all the streets leading into the square. While Erdogan was away, the revolt was allowed to bloom. The self-censoring media, forced by Erdogan to ignore the Gezi uprising just like it ignored every other anti-regime protest, suddenly opened the airwaves to the protesters, who were given a chance to win over the hearts and minds of the nation. 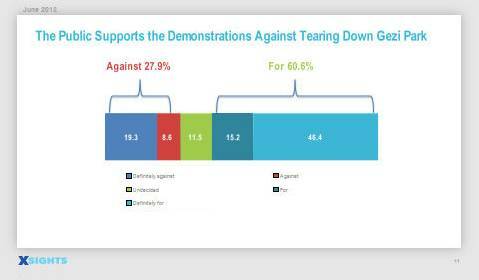 By June 4, over 60% of the population supported the protests. Are these the first signs of a palace revolution in Turkey? In any case, the revolt that is shaking the country since Friday brings to light the conflicts within the Justice and Development Party (AKP) and restarts the campaign of President Abdullah Gül, potential rival of the Prime Minister Recep Tayyip Erdogan. Washington unleashed salvo after salvo of criticism. The top Anglo-US newspapers championed Gül and dissed Erdogan. After Erdogan’s return from his Maghreb tour (which was a flop, King Hassan of Morocco refusing even to meet him) the Gülenists who had given encouraging messages to the protesters went silent, or even, like Bülent Arinç, suddenly flipped and turned hard-liner. Two Gülenists who hadn’t spoken until then, Egemen Bagis and Ahmet Davutoglu, began to spew threats and insults, not just at the protesters but even at the European Union. The venomous rhetoric of his close confidants egged Erdogan on to do another “Davos,” i.e. make a stand against his enemies (and by extension, the enemies of Turks and Islam). He was blissfully unaware that he was digging himself deeper with every word, his own and those of his “trusted” aides. A protest spokesperson on CNN, during the brief “perestroika” while Erdogan was out of the country. 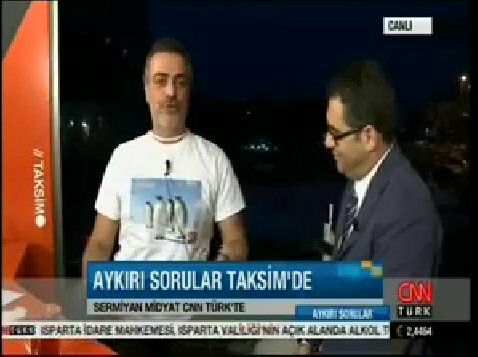 He is wearing a t-shirt protesting CNN’s “penguin documentary” on May 31 while all hell broke loose on Taksim Square. Meanwhile in Qatar, an abortive coup was staged against Sheik Hamad Ben Khalifa Al Thani, Erdogan’s partner-in-jihad, who then abdicated his throne to his son Tamim. The Palestinian daily Al Manar reported that the US uncovered the Sheik’s secret dealings with Al Qaeda as well as his illegal financial transactions. Erdogan felt the noose tightening. At first accusing the main opposition party CHP of being behind the protests, Erdogan finally realized what he was up against and gave orders to his loyal head of intelligence Hakan Fidan to uncover the “foreign plot” against him, just before he left for Morocco. After he returned to Turkey, he continuously railed at the protesters for being stooges of a foreign plot by what he called the “interest lobby.” This non-existent lobby was a figment of his imagination, which was constantly haunted by Turkey’s mounting foreign debt and rising interest payments, which were what got Erdogan into this mess in the first place. After 10 years of Erdogan, Turkey is still a country with a third-rate education system that does not produce any technology worth speaking of. Nor are its worker wages all that low. When compared with South Korea, for example, which was a bombed-out ruin far behind Turkey economically in the 1960’s, Turkey is a huge failure. Koreans were better educated than Turks even back then and they now have the technology to show for it. Nor does Turkey have any significant amounts of hydrocarbons or other valuable mineral resources. What it has is a high-ish GDP based on a consumer economy, much like the United States. Turkey’s GDP growth is fueled by property development, mostly by companies owned by Erdogan’s cronies. Whether or not the real estate bubble that Erdogan created bursts and turns Turkey into a second Spain depends on whether he can find a source of low-interest loans for home-buyers, and/or a large number of rich foreign property buyers. Rates are still too high in Turkey for people to buy these new homes with the equivalent of monthly rent payments. When Erdogan’s AKP was first elected in 2002, his initial hope for knocking down those rates was the Eurozone. If he could get in, he was home free, he could borrow and spend to his heart’s delight. Then came the credit crunch and Nicholas Sarkozy, dashing Erdogan’s EU hopes for the foreseeable future. Erdogan began to look eastward, but saw that neither Russia nor China could give him what he needed. What “saved” him was the Arab Spring. 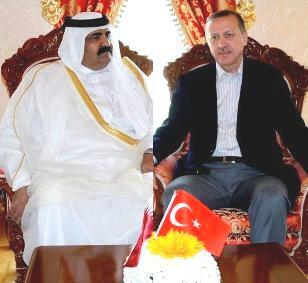 In January 2011, Erdogan went for a tour of Saudi Arabia and Qatar, where he hit it off famously with Sheik Al Thani. However, the horse-trading didn’t end until April 23 or 24, when Erdogan abruptly jumped on board the regime-change bandwagon in Libya. Libyan-Irish Al Qaeda terrorist Mahdi Al Harati kissing Erdogan on the forehead after being wounded on the Mavi Marmara. Erdogan’s “Gaza flotilla” was a successful PR operation to gain Hamas’s trust and break Hamas off from Syria and Iran. 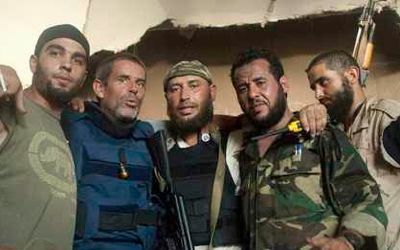 Madhi Al Harati (center) with MI6 agent and “journalist” Paul Conroy (left) and head of the Libyan Al Qaeda Abdel Hakim Belhadj (right), appointed Military Governor of Tripoli by NATO. Belhadj moved his headquarters to Incirlik Air Base in Turkey to coordinate the Al Qaeda attacks against Damascus and Homs in Syria, at the end of which almost the entire Libyan Liwa Al Umma, under the command of Mahdi Al Harati, was wiped out. Turkey can sell 5 million homes in the next 10-15 years for $7-8 billion. This has a multiplier effect. The Arabs who buy homes come here with 10 people every summer. They will send their children to school here, get their medical care here, and set up business here. This is a great opportunity for Turkey. 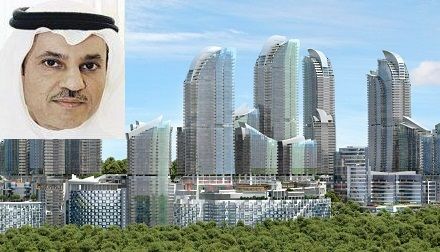 Accordingly, while the Turkish people were being shot with rubber bullets and gassed with military CR gas, Erdogan’s favorite property developer Ali Agaoglu signed a deal worth $200 million cash for two of the towers of his Istanbul 1453 project, a total of 481 homes, with Saudi Sheik Ehsaan Fareed Abduljawad on the holy day of Friday, 7 June, 2013. Agagoglu sold over 900 units in that project alone to Gulf Arabs. Agaoglu (short guy with the yellow tie) marketing his Istanbul 1453 project in Dubai. The Saudi Sheik who paid $200 million in cash for two of the towers. Erdogan’s new “Urban Renewal” project aimed purportedly at making Istanbul earthquake-resistant was in fact a plan for moving poor Turks out and rich Arabs in. Agaoglu’s “1453” project, named after the date when Turks colonized Constantinople, was in fact the symbol of the colonization of Istanbul by tribal Bedouins from the Gulf. All of Erdogan’s grandiose projects, from the faux-Ottoman Taksim barracks to the mega-mosque on Camlica hill to his “crazy project” for digging a second Bosphorus and building a second Istanbul on it, were part of his plan to avoid sovereign debt default by allowing Turkey’s choice spots to be colonized by millions of wealthy, tribal, religiously ultra-conservative Bedouins. Turkey was gradually being purged of its secularism and un-Islamic elements. It was being made safe for Gulf Sheiks and their harems, a place where they would not be shocked by sights of couples kissing, where the media was just as subservient as in their own home countries, where alcohol was consumed only where cameras couldn’t pry, etc. The municipal elections next March will almost certainly reflect a drop in the AKP’s votes commensurate with this poll, which will precipitate a party congress where Erdogan will face off with Gül. Even if he survives that, his bid for an executive presidency is henceforth dead, since he has no hope of changing the constitution to establish a presidential system, no more than he has for changing the party rules that forbid more than three terms in parliament. Erdogan is now officially a dead duck president. As long as the Gezi protests continue, the reins of power are in the hands of Muammer Güler, Fethullah Gülen’s top agent in the Erdogan government. Güler has the power, as the Turks say, of making Erdogan “a vizier or a villian.” Every act of police brutality is henceforth seen as coming from Erdogan, while every conciliatory gesture (such as pulling the police out of Taksim on June 1) is seen as coming from Abdullah Gül (as even Turkey specialist Ariane Bonzon believes). Fethullah Gülen judged Erdogan correcty when he said “Sometimes power can make one arrogant. Even if he is a believer, he becomes morally a pharaoh.” By taking so much authority into his own hands, Erdogan became a very lonely man, surrounded by sycophants and Gülen agents. They are now jerking him around like a puppet, telling him what he wants to hear and feeding him false stories about protesters attacking Muslims that make him look ridiculous when he repeats them. It’s not the gods who are making him mad in order to destroy him, it’s the Hodja Effendi. Erdogan is getting a temporary stay of execution from Washington, which needs him to deliver arms to Al Qaeda in Syria, which is in imminent danger of collapse due to the Syrian “Northern Storm” offensive. Obama needs to keep Al Nusra alive until the upcoming Geneva talks, schedued tentatively for August. When he and Putin make a deal, Erdogan will probably get the final push. Once Erdogan is gone, we Turks will have to deal with Fethullah. This entry was posted in ABD, AKP, Ortadoğu, Suriye, Tayyip Erdogan, İslamcı terör. Bookmark the permalink.